Unistal founded in 1994, an ISO 9001:2000 company, is the market leader in software product and application development with a global footprint of 5 million licensed users spread over 125 countries. Unistal has it’s headquarter in New Delhi, India with development centers at Noida & Pune. Unistal developed its first data recovery software, Quick Recovery in 1998. Today Quick Recovery has world’s largest Range of products which includes data recovery, Server Recovery including Raid servers, File Repairing, email repairing/ recovery, email conversion/ migration and data recovery software for other media like CD’s, Data Card etc. Quick Recovery products cover operating systems like Windows, Linux, Novell, UNIX and Macintosh with email recovery/repairing solutions for MS Outlook, MS exchange, Lotus Dominos, Outlook Express etc. 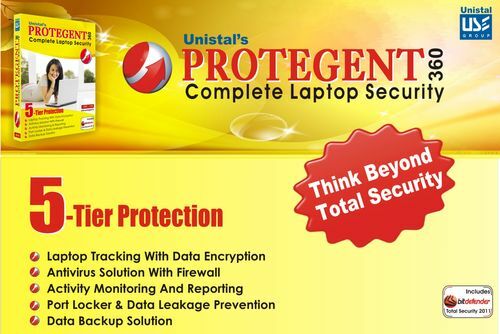 Protegent–The complete Computer Security, CrashProof- The data Loss Prevention Software, Data Wipe- Permanent File Deletion, PC Reporter- Asset tracking, tagging and early warning system are just some of popular brands developed by Unistal. Protegent Enterprise has started a new era in enterprise security with its unique and incomparable features. Equipped with state-of-art labs, gadgets, trained specialists and consultants, Unistal provides confident data recovery Services, data forensics & cyber crime support services. 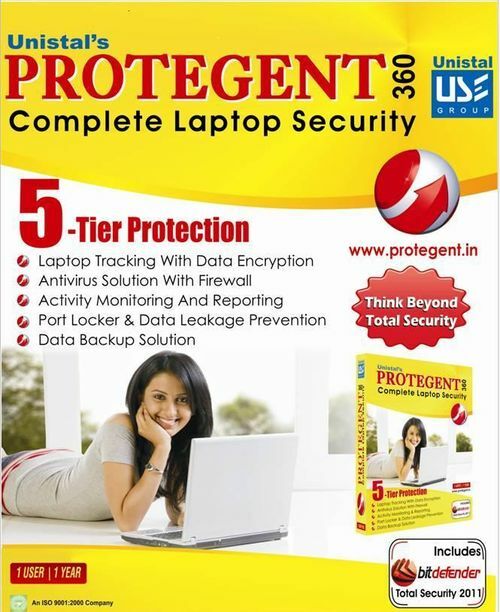 Protegent360 has been design to provide complete security solution to Laptop users. Its 4-tier security protection includes laptop tracking with file encryption; file leakage prevention, antivirus solution with firewall & backup solution. Protegent360 keeps a track of laptop's location whenever laptop gets connected to internet. What is lost is not just the laptop, but also the valuable, sensitive and creative data in it. It contains a smart agent, designed to collect and transmit critical data needed to pinpoint it's location to identify the unauthorized user in case of a theft. It works in a stealth mode and can also silently inform you, about the location of your employee's laptop! Predefined setting allows the user to encrypt his important files and folders whenever laptop is not connected to internet for specified period or detects the stolen laptop. It provides a secure web page for every user to monitor the Location, IP Address, and Internet Service Provider with date and time. It allow user to submit Theft Report online and provides Regular Status updates of laptop location on email. Protegent360 allows the user to safeguard data/ file from unauthorized access. It prevents vital & important data to be transferred from one PC to another using Flash drive, DVD/CD writers, PCMCIA ports, Ethernet ports, Printer ports, Infrared ports. It provides the Options to lock/unlock single or multiple ports with authorized password. 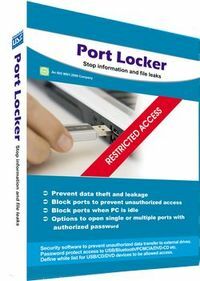 It allow user to lock ports with different lock type options as permanent, specific time duration and when the computer remains idle or untouched. It displays the alert as soon as an unauthorized action is performed against the lock ports. It provides complete log related to Permanent Blocked, Schedule Blocked or Un-Blocked Ports with actions performed including changes in settings, locking and unlocking the ports, setting scheduler etc. Protegent360 keeps your Internet-connected family safe. It provides superior Proactive Protection from Viruses, Spyware, Hackers, and other e-Threats. It locks out viruses, hackers & spam, while providing parental control and firewall protection. This module is powered by bitdefender. Protegent360 comes with a Backup module that helps you make reserve copies of any valuable data on your system. You can backup your data on your computer, removable disks, a network location or to a remote location through FTP. The restoration of your data is an easy process. a variety of backup options, such as compression, encryption, filtering files to back up or setting backup speed are available. It also has a log viewer that helps you keep track of the backup and restore operations you perform and troubleshoot eventual errors. It has refined control when restoring files (for example, you can restore the data you backed up at a specific point in timeThis module is powered by Bitdefender. 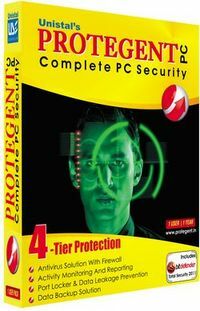 Protegent PC has been design to provide compete security solution to Desktop users. It’s a 3-tier security protection that includes file leakage prevention, antivirus solution with firewall & backup solution. Protegent PC allows the user to safeguard data from unauthorized access. It prevents vital & important data to be transferred from one PC to another using Flash drive, DVD/CD writers, PCMCIA ports, Ethernet ports, Printer ports, Infrared ports. It provides the Options to lock/unlock single or multiple ports with authorized password. It allows user to lock ports with different lock type options as permanent, specific time duration and when the computer remains idle or untouched. It displays the alert as soon as an unauthorized action is performed against the locked ports. It provides complete log related to Permanent Blocked, Schedule Blocked or Un-Blocked Ports with actions performed including changes in settings, locking and unlocking the ports, setting scheduler etc. Protegent PC keeps your Internet-connected family safe. It provides superior Proactive Protection from Viruses, Spy ware, Hackers, and other e-Threats. It takes care of viruses, hackers & spam, while providing parental control and firewall protection. This module is powered by Bitdefender. Protegent PC comes with a Backup module that helps you make reserve copies of any valuable data on your system. You can backup your data on your computer, removable disks, and a network location or to a remote location through FTP. A variety of backup options such as compression, encryption, filtering files to back up or setting the backup speed are available. It also has a log viewer that helps you keep a track of the backup and restore operations you perform and troubleshoots the errors. It has refined control, when restoring files. This module is powered by Bitdefender. All major companies strive hard to protect their intellectual property rights, their formulas of success a closed guarded secret and for the process of guarding their secrets they invest very heavily to develop and implement a foolproof mechanism to prevent or cause any harm to them. Activity Reporter would be a very important tool for companies to monitor all the activities of their computer users. This would be an ideal spy camera without the knowledge of the user that their every key stroke/ every activity on the computer or internet is being monitored and screen shot / report is generated on a regular basis. The unique feature of Activity Reporter to whitelist and blacklist applications would enable the organization to monitor more effectively. The various options of reporting along with the different formats of reporting would ensure monitoring is effective and keep the network more secured. 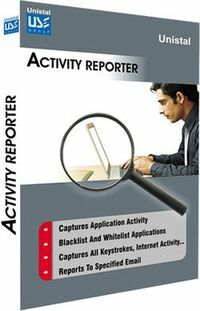 The features of Activity Reporter would definitely act as a foil for anyone to do any fraudulent activities in the organization. Application monitor time log can be maintained for specific applications. White list: application added no activity recorded. All Internet activity captured with feature of Blacklist and White list. All keystrokes with case sensitivity captured. Screenshots on every mouse click or within the specified time interval. Captures the desktop and capturing the foreground window also. Logs working hours and idle time. Select the level of tracking. ICQ, Miranda, Skype, Google Talk, MSN, AIM, AOL, Yahoo, QIP chats captured. Captures contents of password protected web pages. Instant installation from a memory card or a flash drive. Increase in Laptop sales and users has led to high incidents of theft. What is lost is not just the laptop, but also valuable, sensitive and creative information in it. 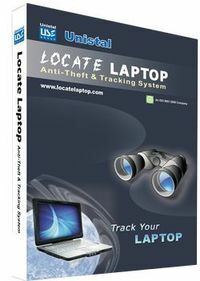 Locate Laptop™ is an application that locates reportedly stolen laptop from the World Wide Web. It can also silently inform you about the location of your employee's laptop. Locate Laptop™ is a software designed to locate and recover lost or stolen laptops. The Locate Laptop™ uses a smart agent designed to collect and transmit critical information needed to pinpoint it's location when lost or stolen and/or to identify the unauthorized user in case of a theft.Locate Laptop is the best and only possible method to locate stolen laptops. Locate Laptop Software works in a stealth mode.